Steele Solutions is the industry leader in the design and manufacture of engineered steel mezzanines and equipment platforms. 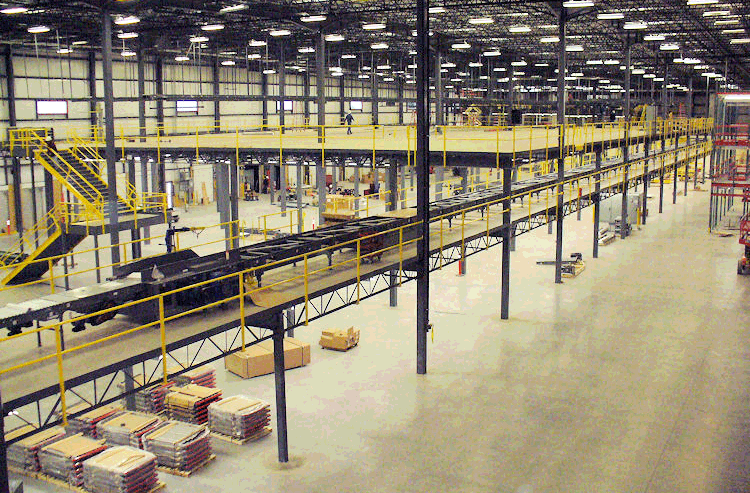 Our mezzanines and platforms are used throughout the world in distribution centers, fulfillment centers, sortation centers, warehouses, manufacturing plants and industrial processing facilities, military installations, and wherever the building occupant needs to maximize the use of square footage or support equipment. provide safe access over machinery and materials. See our Framing Guide to learn the capacities, advantages and limitations of the various connections used in mezzanine and equipment platform design. Read more about our design expertise. Read the formula for our superior quality. See more examples of mezzanines and platforms we’ve designed and built. We have been a manufacturer of industrial mezzanines and equipment platforms since 1996, and have continuously grown since then because of the way we treat our customers, the quality of our products and the integrity of our solutions. Access – Catwalks and Crossover Bridges provide elevated access at interior and exterior settings, between machinery or equipment, over equipment, and between buildings. See Catwalks Page or our Crossovers Page for more information. Bulk storage – Use warehouse mezzanines and elevated platforms to store different-size items off the ground. Storage mezzanines and storage platforms are ideal for storing items that don’t fit well in racks.